Susi Blocker makes a play for the Lady Wave at first base in team’s win over Vandalia-Butler. The Greenville fastpitch team kept their undefeated league record intact with a win over Vandalia-Butler. The Lady Wave fell behind early, but quickly recovered and built a commanding lead that they maintained the remainder of the game. When the game was over it would turn out to be a respectable 11-3 win. The first inning ended up scoreless, but the Aviators had a bad turn. A bad turn in that starting pitcher Sydney Theobold turned her ankle trying to out race Susi Blocher to first base. She was done for the rest of the game and Emmalee Martstellar had to come in to relieve her. Martstellar made short work of the Lady Wave in the second inning, holding them scoreless despite a close play at the plate by Blocher who was tagged out. But after that initial inning the Lady Wave began to figure her out and start tagging her for hits. Butler struck first in the second inning when Megan Allen connected on a Kennedy Fashner pitch and sent it over the center field fence. There were two runners aboard so that gave the Aviators an early 3-0 lead. So despite the loss of their pitcher, Butler showed that they came to play. It was up to Greenville to get back the momentum. Courtney Bryson, Morgan Gilbert and Lani Shilt got back to back to back hits in the Lady Waves next at bat. This allowed Greenville to tie it up at 3-all. Now the defense responded and it was a 3-up and 3-down inning for the Aviators. Greenville’s bats would stay hot the remainder of the game. Four runs in the fourth to take the lead, then two in the fifth and 1 more insurance run in the sixth. Defensively the Lady Wave did make a pitching change in the fifth inning, bringing in Grace Shaffer to take the team the rest of the way. She did her job, holding the team scoreless. The Wave is now 8-1 and 7-0 in league play. 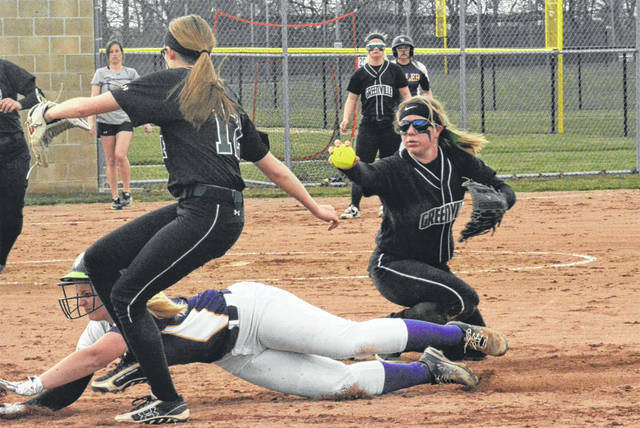 https://www.dailyadvocate.com/wp-content/uploads/sites/34/2019/04/web1_Blocher.jpgSusi Blocker makes a play for the Lady Wave at first base in team’s win over Vandalia-Butler.